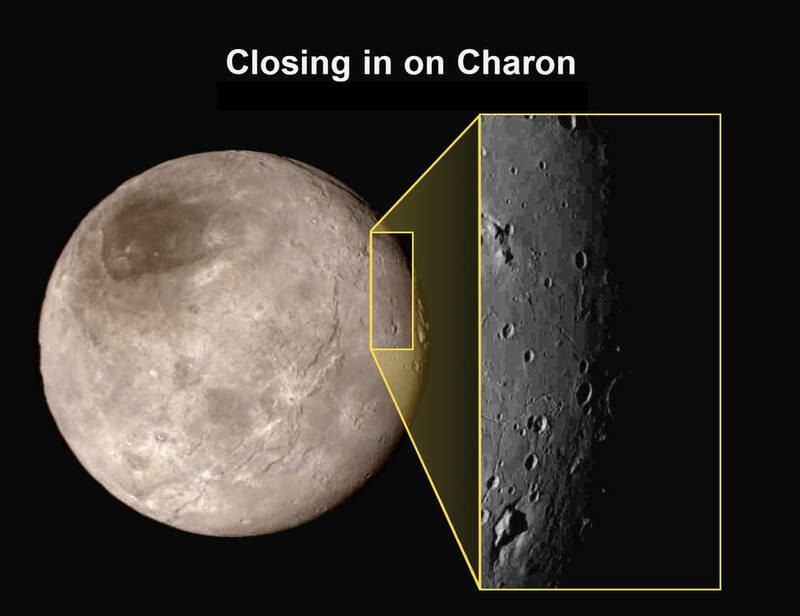 July 16, 2015 – This new image of an area on Pluto’s largest moon Charon has a captivating feature — a depression with a peak in the middle, shown on the lower left of the inset. The image shows an area approximately 200 miles (300 kilometers) from top to bottom, including few visible craters. This image gives a preview of what the surface of this large moon will look like in future close-ups from NASA’s New Horizons spacecraft. This image is heavily compressed; sharper versions are anticipated when the full-fidelity data from New Horizons’ Long Range Reconnaissance Imager (LORRI) are returned to Earth. The image was taken at 6:30 a.m. EDT (10:30 UTC) on July 14, 2015, about 1.5 hours before closest approach to Pluto, from a range of 49,000 miles (79,000 kilometers).